A couple years back, colleague Rick Minter was talking about stock-car racing then vs. stock-car racing now. The topic morphed to drivers. Minter emotionally described how he and his father used to run into them down at the Waffle House near their home in Georgia. That’s right kids, NASCAR drivers used to eat at Waffle Houses. Mingling, even, with the local folks. It was another reason to love the sport. After Sunday’s Sprint Cup Series race at Martinsville, if you could get close enough to Victory Lane or had a big enough television, you could get a brief, rare glimpse of a Waffle House moment. 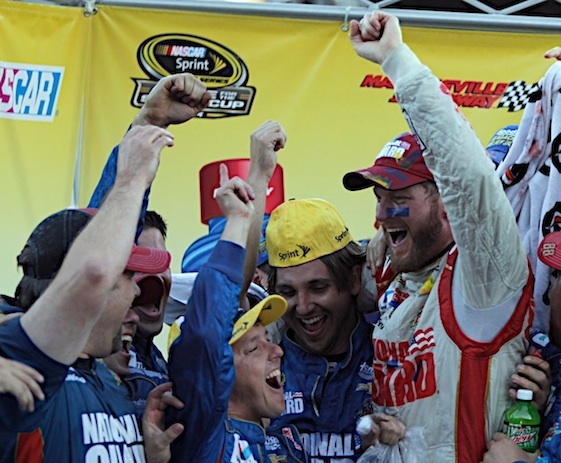 There were Dale Earnhardt Jr. and his team bleeding the type of and honest emotion and joy that used to make fans feel good about being fans. Little-kid joy. Except it was a grown man grinning through the windshield as he took extra-added-bonus victory laps around the Martinsville half-mile. And it was grown men jumping around like grasshoppers on a hot plate in Victory Lane. Earnhardt had won his grandfather-clock trophy and it was very clear how much that meant to him. To be sure, that clock is sitting today in the kind of home that most of us will only see on the Lifestyle Network, but there was also a welcome bit Ken Burns that came with Earnhardt’s victory. Junior, as most know, is a new-schooler but with a love and, of course, a strong connect with stock-car racing history. That came through with 1080p clarity during his post-race press conference. The moderator suggested the obvious right off the bat; that the win must be special. “It sure is,” Earnhardt, the grin still in place, said. “You know, I love the history of the sport and just can’t get enough of like all these pictures on the wall in here. I just know this place has a special meaning and a special place in the series and the sport. “Been coming here so many years, I’ve been coming here since the early ’80s, watching races here. Dad won several races here, brought home several clocks. I remember one in particular that set at the front door, in the hall by the stairs. Had this little round rug right in that hallway that I’d run my Matchbox cars on, listening to the race on the Racing Motor Network. That clock would ring on the hour. “I always wanted one. I came close I think several times. We had some good finishes here. Even with Tony, Sr. and Tony, Jr. in the Bud days, we had pretty quick cars here. Several years I think the car should have won, but the driver didn’t. Junior can afford to buy 10,000 grandfather clocks. But from the sound of it/look of it, he simply couldn’t afford to not have one from Martinsville. Not to tell him what time it is, but to tell him all about his place in the history of auto racing. Asked where the clock would sit in his home, Earnhardt said, “I’m going to leave that up to (girl friend) Amy, where she wants to put it. I’m glad to hear her say she thought it was beautiful. It will get a good place up front somewhere, hopefully in the living room. Judging from photos Earnhardt posted on social media, he and Amy found a prominent place for the clock. Once, that is, they finally got the dang thing working – it appeared from photos of Junior crawling around on the floor, that some assembly was required. Also refreshing were remarks Earnhardt made about the importance of winning races. They were remarks that explained that huge ocular cavity to ocular cavity grin that he wore during his victory laps even though those laps came a week after he was bumped from the Chase for the Sprint Cup Championship. Asked if winning races was still important to him, Earnhardt said, “Hell yeah. Hell, there’s no better feeling that I know of. I haven’t won a championship, so I don’t know what the hell I’m missing. But this is absolutely incredible. “Yeah, I mean, we’re disappointed we’re not in the Chase or don’t have a chance for the title. But I can’t even imagine. That’s just too much to even ponder what winning a championship would be like. “I know how fun winning races is, how hard it is to win races, especially at this particular racetrack. How many years we’ve been coming here and trying to win. Yep, Earnhardt is new school, but he still speaks fluent Waffle House. It’s an all but moribund language that a lot of people miss like crazy. Great article, as always. Could you imagine if HMS was a Formula One team? Jr. would have been told to drop back and let Gordon win as the only team car with a shot at the championship.